Whisk sugar, milk, 2 cups whipping cream, vanilla, eggs and cinnamon until blended. Pour over bread mixture. PRALINE SAUCE: Heat 1 cup butter in large saucepan until melted. Add pecans and mix well. Bring to a boil. Cook until pecans begin to change color. (Mixture will foam over, so use a large saucepan.) Add remaining butter and mix well. This will cool the pecan mixture and stop the cooking process. Remove from heat. Combine brown sugar, whipping cream and cinnamon in a saucepan and mix well. Cook over low heat until blended, stirring constantly; increase heat. Cook to 230° F on a candy thermometer. Stir in pecan mixture. Add sour cream and vanilla and mix well. Remove from heat. Traditionally, bread pudding is served as a dessert and is made with white bread that’s a few days old. Clearly, there’s nothing stale about Famous Dave's™ bread pudding recipe though. Bread pudding lovers, people who thought they didn’t like bread pudding and those who don’t even know what the heck bread pudding is tend to go gaga over the notorious and nostalgic dessert. Our riff on the sought-after restaurant version begins with swirled cinnamon bread that gets soaked in an easy, sweet-cream custard and finished with a buttery, nutty praline sauce. 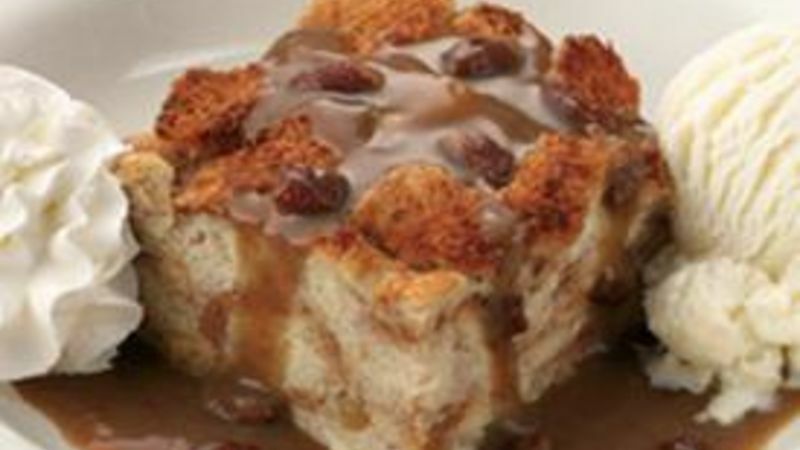 Like Famous Dave’s, this bread pudding comes out crunchy on the outside, and soft and creamy on the inside. As ice cream improves everything, this dish tastes incredible served alongside a dollop of ice cream or topped with whipped cream, as do many of our other drool-worthy desserts.